Your skin will be glowing in no time with this powerful glycolic acid kit. Glycolic acid ramps up collagen and elastin in the lower layers of skin giving a younger appearance over time. Revitalizes dull, sun damaged, tired skin and lightens sun damage/hyperpigmentation over time with consistent use. Firms, tones, and restores youthful glow, shrinks enlarged pores. Removes dead skin and pore clogging debris to unclog pores and effectively treat breakouts. This kit is made for individuals who want to see results with use for brighter and younger looking skin. Planet Eden's Glycolic Pre-Peel Cleanser is a AHA, vegetable derived, cleanser. Contains pharmaceutical grade Glycolic Acid (fermented sugar), and botanic extracts, to reduce the appearance of fine line and wrinkles for a firmer, more youthful, appearance. Organic fruits extracts of Apple, Bilberry, Lemon, Orange, Papaya and Grapefruit nurture and pamper your skin! The Pre-Peel wash will enable the glycolic acid peel to penetrate the skin and have a more successful peel. Antioxidant Recovery Cream repairs your skin while you sleep, and your body is in healing mode. Speeds the healing after a skin peel. The glow of smooth, healthy skin is just a step away. You'll notice an improvement in hydration, and suppleness, within just a few uses, and will continue to see improvement with regular use. YOU WILL NEED A SKIN PEEL NEUTRALIZER TO STOP THE SKIN PEEL.ATTENTION: Please do the proper research to select the proper strength for your skintype, these acids will take 4-5 applications to get the right timing for your skin. Results vary from person to person. STRENGTH RECOMMENDATIONS: Dry/sensitive skin and beginners (who are not overly oily) should not use anything higher than 30-40% strength. Combination to semi-oily skin should start with 40-50% strength. Experienced peel users and/or oily/resistant skin should use 60-70%. All peels can be diluted with water to lessen strength. 3 powerful products to help with dry, dull, stressed skin to get your youthful glow back! This professional kit includes: 1 OZ of 30% Glycolic acid (15-20 peels), 2 OZ of Glycolic Acid Pre-Peel Cleanser, 15ml Antioxidant Recovery Cream and fan brush. Antioxidant Recovery Cream is loaded with all natural botanical extracts to replenish thirsty skin after a skin peel or anytime. 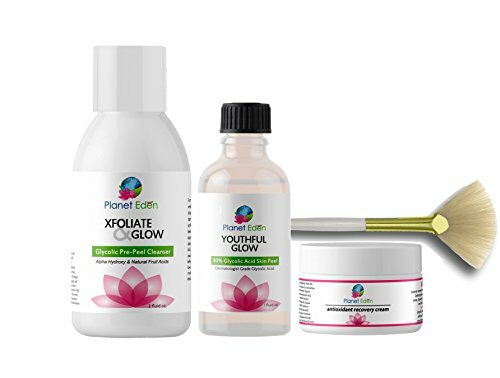 If you have any questions about this product by Planet Eden, contact us by completing and submitting the form below. If you are looking for a specif part number, please include it with your message.